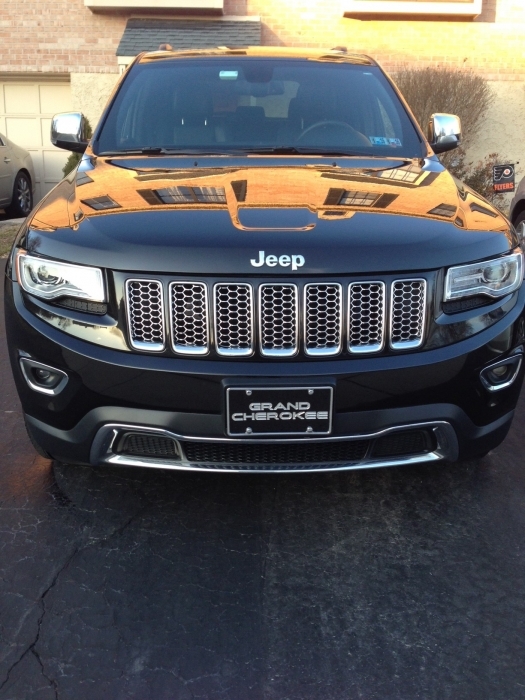 Give your new Grand Cherokee a stylish and upscale look with chrome honeycomb grill inserts. 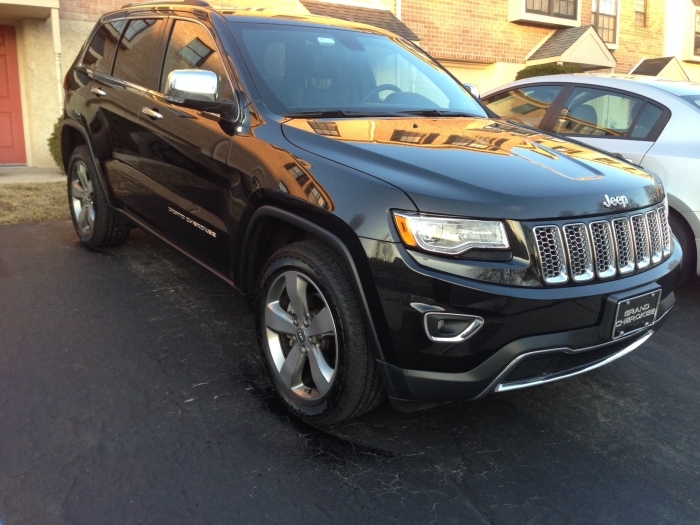 Able to be fitted to any 2014-2016 WK2 Grand Cherokee, this small, yet very noticeable upgrade is sure to turn heads. 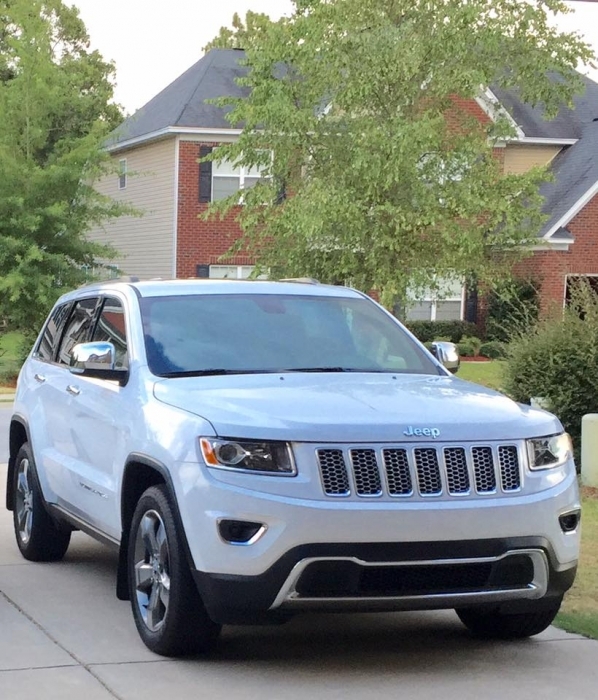 This item will fit all 2014-2016 Grand Cherokee models, except the 2016 75th Anniversary model Grand Cherokees. 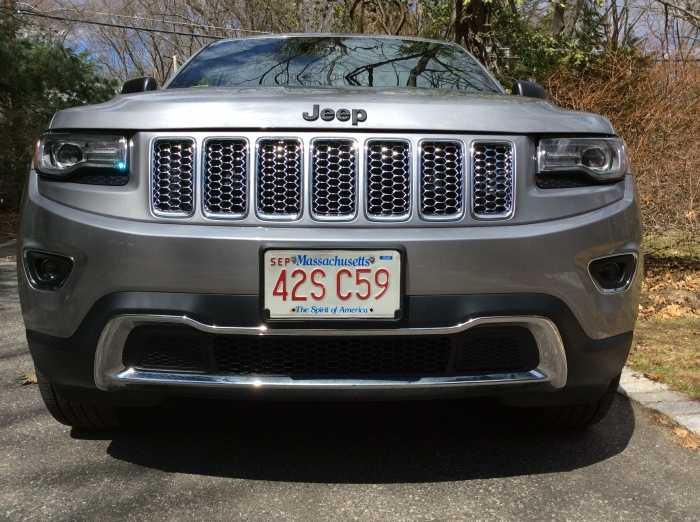 The chrome honeycomb grill inserts look great on the new Grand Cherokee (mine is a 2014) because it compliments the rest of the chrome found on the Limited model. In my opinion, this simple addition really steps up the GC's exterior appearance and makes it look a little classier without being "over the top". I took the grill to my Jeep dealer to have it installed because I figured if I just I spent all of this money on a new SUV, I wanted Jeep mechanics to remove the front bumper and properly install the grill inserts. Plus, I was able to negotiate a cheaper installation price since I recently purchased the vehicle from the dealer. The product was quickly shipped and wrapped well so there were no issues during transit. This site had the best price I could find for this part. ConsFor professional installation, the front bumper should be removed. What a nice looking upgrade to the front of my jeep. First off shipping from JustForJeeps was quick and painless. The install, not so much. 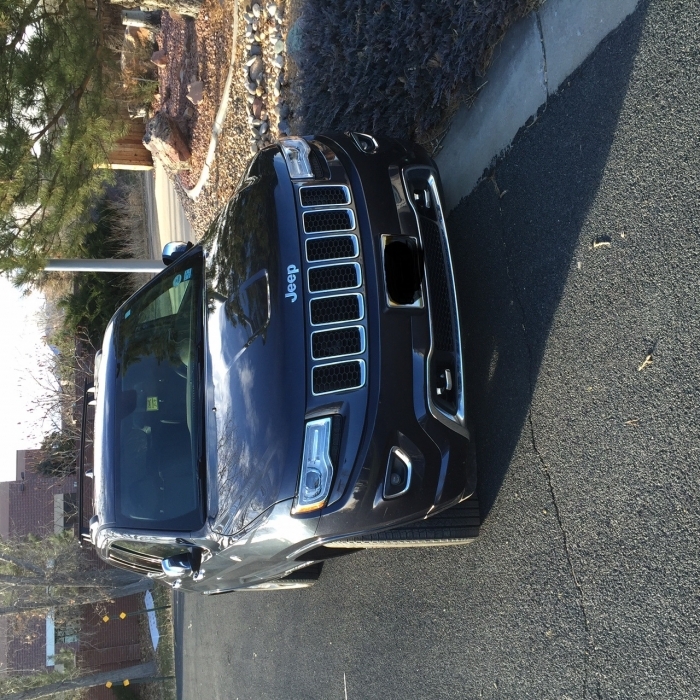 Like other reviewers here, I did not take off the front bumper. I figured it would be easy enough to squeeze my arm in and pop out what I needed to. After watching a youtube video (listed below) I should have just taken off the bumper. You would need a plastic rivet tool and new rivets if you do this. Please just purchase the rivet tool and extra rivets and do it the right way. I know I did some damage with various tools (screw driver, flash light, allen keys, scissors) but thankfully the new piece still had enough material to clip into. The old black inserts were completely destroyed. 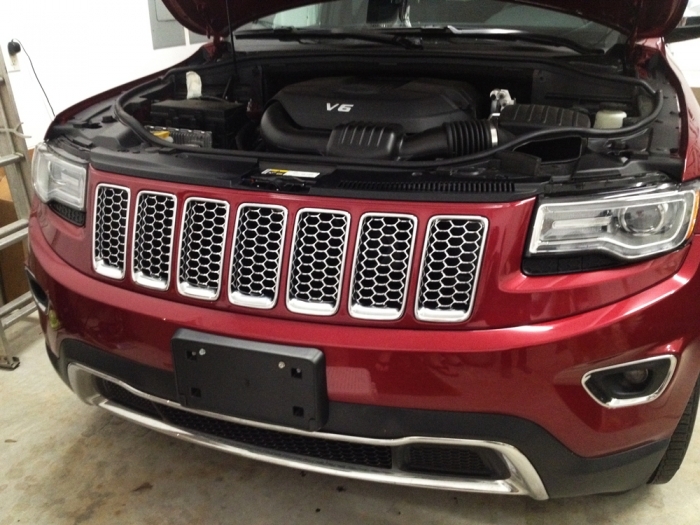 "2014 Jeep Grand Cherokee front grill and bumper cover replacement"
As others have mentioned the install can be a PITA. So I decided to cut out my stock one and install via the 7 slots, which extremely easy. I knew I was never going to put the stock one back in, so I didn't care that I trashed it. Then I painted everything black because I am not a fan of chrome. I think it's the best mod for the money. Installed the item myself by reaching down through the top of engine bay area. Definitely not easy to install if you decide not to take the bumper off. wrist and forearm. HE WAS RIGHT. After reading a positive review on this item I decided to go for it for my new '14 Grand Cheorkee Limited. Once completed the look is so much better than the stock black plastic grille. This sucker is difficult to install though, as was reported by the first reviewer. The instructions, which were sent upon request by justforjeeps.com (thanks so much for the quick response! 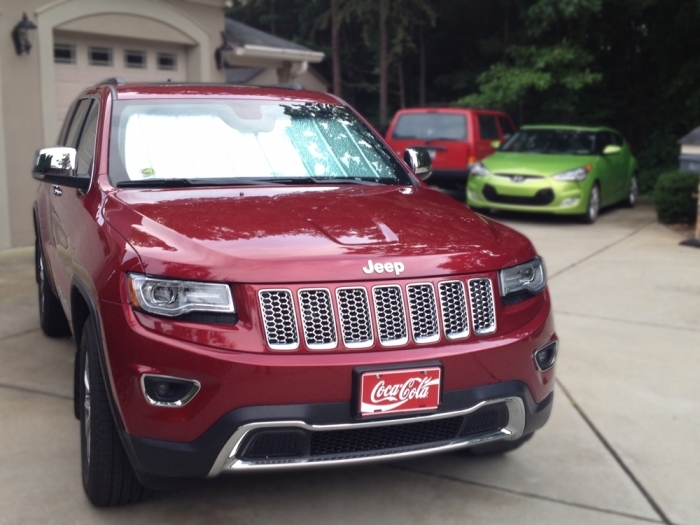 ), have you taking off the front bumper to get at the grille. This was way too much trouble for me. So, like the first reviewer, I went at it from the top by removing two plastic grommets. It is indeed a tight squeeze to get your hands/arms down there to work on it. You have to be very forceful to pop out the existing grille. It was quite difficult. My forearms and hands are quite scraped. Make sure you wear work gloves if you're attempting this method. I put them on halfway though and was glad I did. Once you get the stock grille out, the new one pops in fairly easily. Note: Make sure you have the grilles (three separate pieces) oriented correctly or else they won't pop in place correctly. Upon completion you will be very impressed with the look. A heck of an upgrade for $30 + shipping!! Check out my before and after photos. ProsAwesome look over the original on the Limited model. I ordered this grille for less than $30 on here which I couldn't even believe it was that cheap. I received it quickly and on the date estimated. The part did not come with instructions, but all I had to do was ask you guys and I received the instructions within 5 minutes via email which I thought was fantastic. I installed the grille myself and couldn't believe the dramatic impact on the looks of my GC. It was quite the process to take the stock grille out, as I opted to go through the top by removing a couple rivets instead of dropping the whole bumper. This method would only work for me, a woman, or a guy with smaller forearms, as the area is really tight to maneuver. Totally worth all the scrapes and bruises!! I would highly suggest purchasing this grille for your GC, especially if you have the limited because it just pops with the already chromed mirrors. I did this without removing the bumper through the top. It is fiddly but if you take your time it is easy to do. Well worth the effort and odd graze to my forearms. 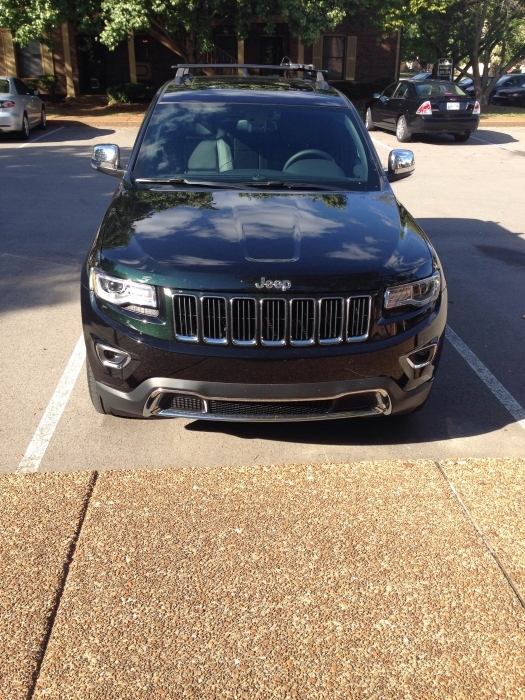 I purchased this grill back in December for a Christmas gift for my boyfriend's 2014 Jeep Grand Cherokee. He LOVED it! It's really takes the car to the next level. We didn't mess around with the installation. Instead, he took it to his mechanic and it was about $60 for installation. Well worth it, since I read it can be a pain to install. We are very happy with the purchase not to mention I received this product the next day after ordering! 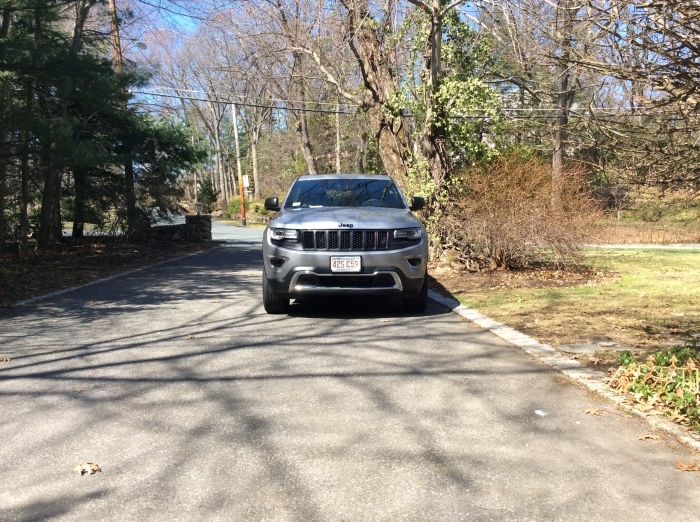 Thank you Just for Jeeps! 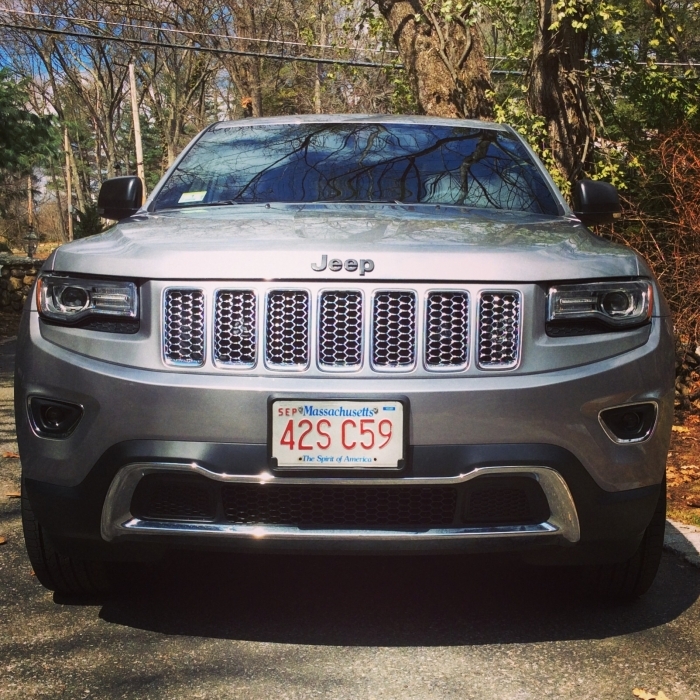 The earlier Grand Cherokee used to offer the chrome grill option on the Limited and Overland models, however, now it's difficult to find the Limited model with the chrome grill. As such, like most ppl here I had to install the chrome three piece 7 slot grill. Trust me, save yourself the headache and time by having it installed professionally. I found an auto body shop installer who took 1.5 hrs & charged $80 here in Tampa, Fl. ProsCost was economical ($39.95) including shipping...aesthetically it looks more prestigious, more glamorous...it simply enhances the vehicle! ConsI was smart enough to realize my installing limitations: a professional who used several different pwr tools including an assistance took 1.5hrs. I'm 100% satisfied with the quality and fitment. Once installed, these inserts made a huge visual difference. Removing the front bumper wasn't that hard for me. I watched a video on YouTube,and took me like 45 minutes. Received quick and un-damaged. Installation another matter; after reading reviews I decided to have it installed. what was needed because of repairing two Jeeps that were wrecked. Chrome grill changed the look of my car making it more fancier.. I love it. ConsVery expensive. Between labor and material cost me almost $500. Looks great on my GC Limited. I wish I took advantage of the lower price before Mopar made the correction but still worth it! When I ordered it I had ideas of installing myself but when they arrived I got cold feet and drove down to my dealer who popped them in in no time. I love the look and wish I did it earlier! Purchased for $27.22 in 10/13, why is this $192 now?!? Installation required removing the front bumper which was very difficult, especially as no instructions are included. However once installed. this makes a huge impact to the front styling of the Jeep and I've have been very happy with the quality. However, I purchased this for $27.22 in 10/13, why is this $192 now?!? Merchant Response:We are glad that many customers were able to take advantage of the extra low price Mopar had these for. Unfortunately Mopar found they had these priced incorrect and has since adjusted. ConsDifficult to install Price jump from $27.22 to $192?!?!?!?!?! As has been said here by everybody, this is a royal PITA. I also went from the top but like others I cut away the old grill slats giving myself good access through the slots for removal. I found a short palm drive with a wide head helped release the tabs and with the help of my son holding the grill out and keeping light on the subject we were successful. I did, even after taking precautions scratch my arm but as has already been stated it was so worth the blood spilled. Be gentle and patient as to not break anything and you will be rewarded. It is worth the $30 and 45 minutes of time. ProsIt really was the finishing touch that the vehicle needed. ConsNone,D if you are hesitant pay the dealer to put it in. This is a Mopar product that looks great and was shipped super fast! I'm very happy, looks good, just like the summit model. A lot of the previous reviews state how difficult it is to install these inserts. It was not that hard and takes approx 30 minutes. Open your hood there are two plastic rivets you pop out above the grill. Then pull up carefully to 'unclip' the top of the grill...this allows access to the current grill inserts and allows you to install the new ones. With a large flat head screwdriver carefully pry the OEM inserts out (you will hear a pop or click ). Remove the three insert sections and install your new ones. Looks great - not easy to install (but not that difficult, either). First - this product looks great once you get it installed. Second - if you are not mechanically inclined, order the product and take it to your dealer for install. 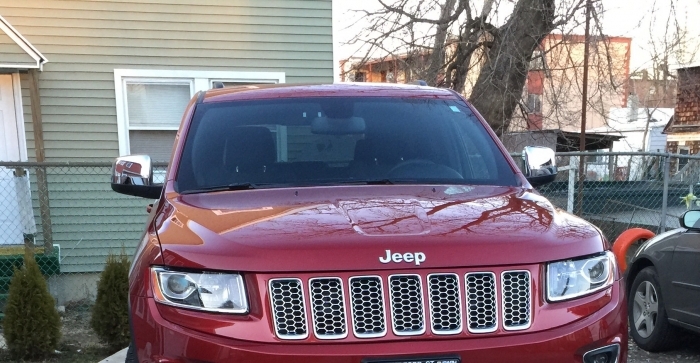 After reading the other reviews on this site, I first tried to install the grille inserts by going through the top. Everybody else who wrote reviews warned of scrapes and cut hands, but I still have no clue how anybody was successful getting the inserts through that small of an opening.I did not want to ruin my car or the inserts, so I elected to remove the bumper - and by bumper, I mean the entire front fascia of the Jeep. Having some mechanical skill by virtue of heredity and nothing more, I took to the task of following the instructions to remove the bumper fascia. First - when removing the fender flares, the 2 frontmost plastic clips holding on the fender flares are actually rivets (you have to cut them off). From the dealer, those rivets are $4-$5 each. Second - you only really need to remove the frontmost 2 rivets and one 10mm bolt in order to pull enough of the flares away to remove the front fascia. The rest of the "rivets" on the fender flares, however, are actually removable clips that you don't have to cut. The lower retainer clips are the easiest part of the process of removing the bumper. I struggled for awhile to remove the fascia, and was about to give up until my much more mechanically inclined father happened by. He had a lot more success that I at removing the front fascia. When asked how he was able to do what I could not, his response was classic retired dad wisdom. "I just pulled harder than you - I was not worried about screwing anything up because it is not my new car." He was right, I did not want to pull too hard and screw up anything, and thus, could not complete the task effectively. In the end, the front fascia went back on with a bit of not so gentile prodding. If I had it to do all over again, I'd just take it to the dealer. 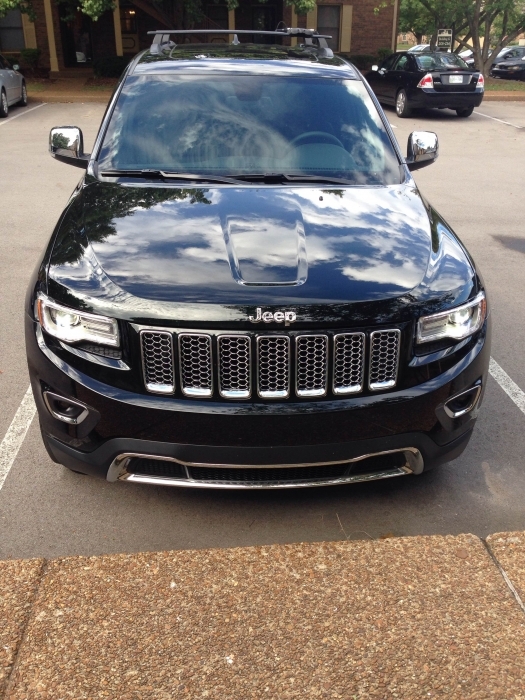 I purchased a Chrome Honeycomb Grill to replace the stock grill on my 2014 Jeep Grand Cherokee Limited. As advertised it was the exact genuine Mopar grill. 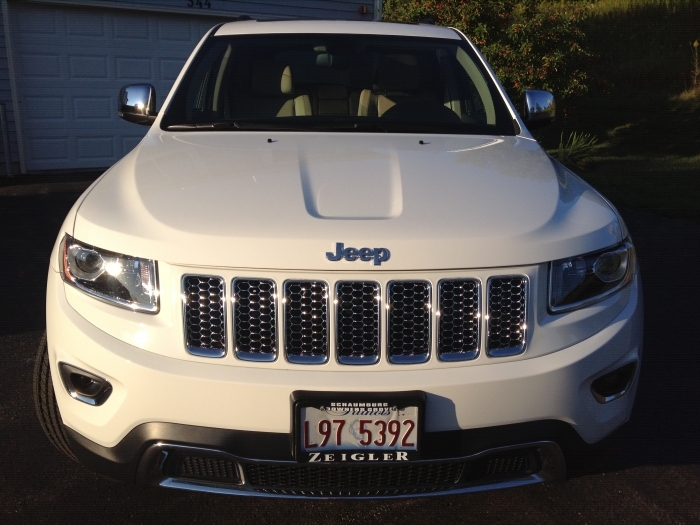 The grill is an $1100 chrome package if bought at the dealer and is usually only found on the most expensive models. To say the product is a value is an understatement. Went to a Jeep dealer who installed it for $75 bucks. It completely upgraded the look of the car to another level. 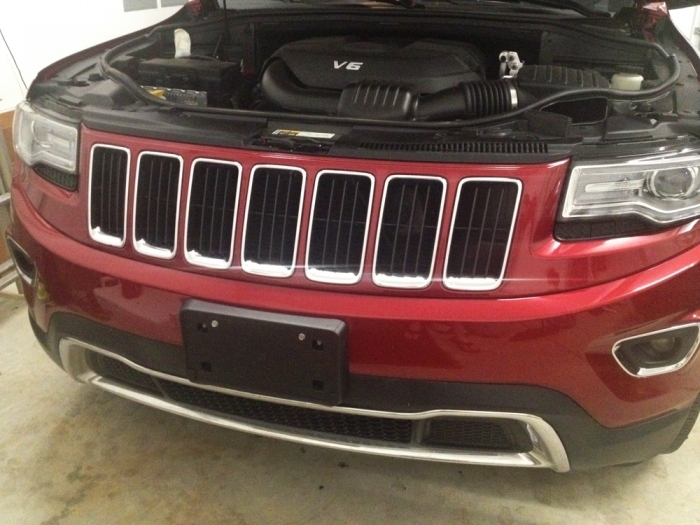 The grill was shipped ASAP as well, which was great bc I couldn't wait to put it on my new Jeep. Amazing website and product!!!! All in all it was about forty minutes of work to get it installed but it is well worth it. The difference to the front end is amazing!! Shipping was quick and the product is exactly as described online. Best thirty dollars I ever spent. Read all the reviews. Decided to go from the top, removing the two top grommets first. Saw on line video the upper black section is attached to the grilll and is all in one piece, but you can bend it forwards to get some access to the rear of the grill area. Tried cutting out some sections but good pressure from the front of the grill pops out the tabs some of the time. Once you get started it gets easier, used a flat head screwdriver to prise out some tabs. Took about 30 minutes in all to get out the 3 sections. Putting in the new sections is a 5 minute job after that. The work gloves are a good idea and it helps to have smaller hands. End result is great, amazing transformation for $30 plus. I like that you cannot see the horns now as well. Much better. ConsAwkward to install but the tips here helped a lot. As the other reviews said this is difficult to install and I did so too without removing the bumper. I had the orgInal plastic grill. I found the best way is too cut the grill out with wire cutters and then you can get to it easier. You will have to be forceful but careful and the new one will snap right in. Good luck! I tried going at it from above like other reviewers said, but had way too little room. Even if I could have gotten the center piece replaced (there are three chrome pieces to cover the seven slots, a double piece on each side and a triple piece for the three middle slots) I saw no way to reach the side pieces. I asked my dealer to do it the "right" way by removing the bumper and they charged $97.50 labor. 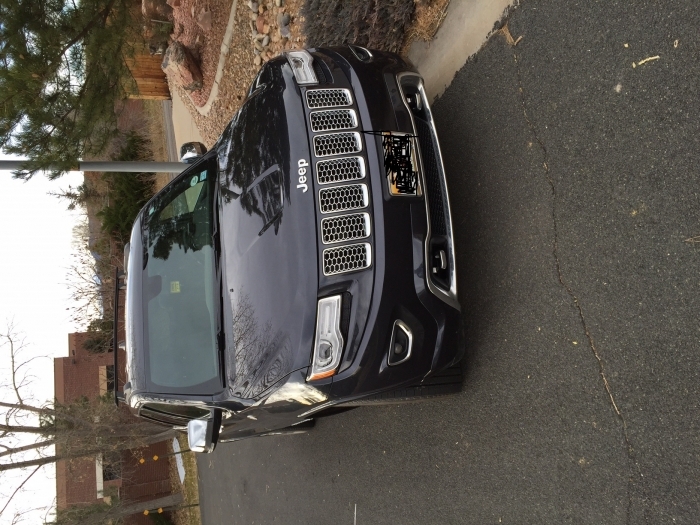 It was well worth $125.00 total out of pocket, huge improvement to my 2014 Limited, and they replaced the reusable connectors/rivets on the bumper which are not really all that reusable in reality. I purchased these chrome grill inserts and I'm 100% satisfied with the quality and fitment. A mechanic friend and myself took the bumper off, instead of attempting to change these out from the top. Doing so made the process much easier, and we completed the task in 30 minutes! Once installed, these inserts made a huge visual difference, and the quality is completely OEM and exactly like the Summit grill! 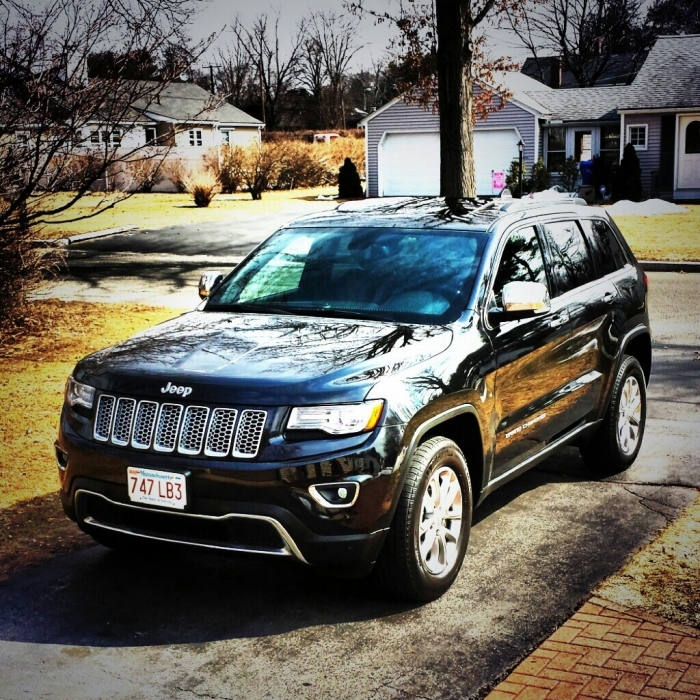 Couldn't be happier and my 2014 Overland is a real head-turner now!!! ConsA little more than light effort required to install, but not extremely difficult if you follow the YouTube instructions for bumper removal. $38 shipped, what more can I say? Super easy to install coming thru the top. About 20 minutes with two people. One holding the bumper slack and the other popping out the stock grille. Looks 1000 times better. ConsYou'll get some scratches but you'll love the results.